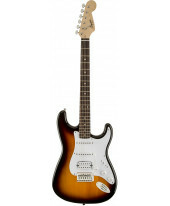 Guitarra Eléctrica Fender Squier Bullet Stratocaster HSS AWT. Corpo: Basswood; Acabamento: Polyurethane. Braço: Maple; Formato: "C". Escala: Indian Laurel 25.5" (64.8 cm); Raio: 9.5" (24.1 cm); Pente: 1.6” (40.6 mm) em Osso Sintético. Neckjoint: Bolt-On; Neckplate de 4 parafusos. Inlays: Black Dot. Cutaway: 19. Ferragens: Ponte: Synchronous Tremolo; Botões: White; Hardware: Cromado. Trastos: 21 Medium jumbo. Electrónica: Passiva. Pickups: 2x Single Coil Standard Strat® ; 1x Humbucker Standard Strat® . Cor: Artic White. Our Bullet Strat® with tremolo is a simple, affordable and practical guitar designed for beginners and students. 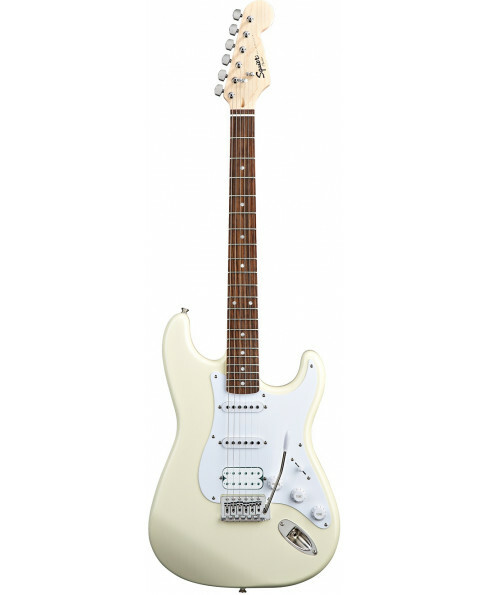 Classic styling that includes the added benefit of a one humbucking/two single-coil pickup configuration -- other features include 5-way switching, synchronous tremolo, and a maple neck with Indian Laurel fingerboard and 21 frets.